There are times when a review must, by necessity, become more than mere words praising or critiquing a literary work. When a reviewer recognizes a monumental injustice, then there arises a moral obligation to sound a clarion call in the hopes of shedding light on the issue. This is such a case. Read on. Over twenty-five years ago, writer Charles Saunders created a new sword and sorcery hero whose roots and adventures were set in the mythological past of the African continent. For the first time ever, a writer had eschewed the dominant overshadowing umbrella of Western-European culture for an untapped history that was totally unique to its corner of the world. From this unbelievably rich untapped mythological tapestry came Imaro, a mixed blood outcast raised by the grasslands warrior people known as the Ilyassai after his mother abandoned him. He grows up bitter and resentful, his own salvation being that he is bigger, stronger and faster than anyone in the village. Once having achieved manhood, he leaves the tribe to seek out his destiny and perhaps learn the reasons why his mother gave him up as a child. In the subsequent short stories and novels, Saunders took us on a fantastic journey through this rich and original African landscape. Along the way we discovered Imaro was in fact an unwilling pawn in a cosmic struggle between the forces of good, represented by the Cloud Striders, and evil, alien beings known as the Mashtaan. For centuries, the Mashtaan had been manipulating their earthly agents, wizards known as the Erriten, towards their ultimate goal of ripping apart the dimensional barrier between their world and ours, thus allowing them access to invade Earth. To stop them, the Cloud Striders set in play two remarkable humans, both touched by their celestial powers while still in the womb; the first was the sorceress queen Kandisa and the second, Imaro. As he states in his afterword, Saunders initially planned to tell this saga as a trilogy, but the more he wrote of Imaro’s travels and adventures, the more the epic scope of his story continued to swell until he had no recourse but to continue on to a fourth, concluding chapter. This writer is damn happy he did. 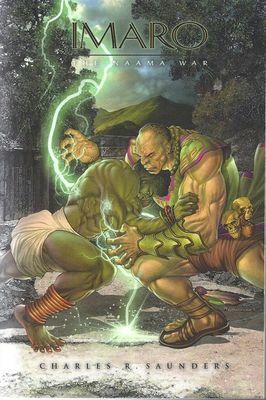 At the end of book three, “Imaro – The Trail of Bohu,” Imaro’s wife and young son had been brutally murdered by the demigod fiend, Bohu, working as an agent of the Eritten. Incensed by the crime, Imaro, along with a few loyal allies, sets out to hunt down Bohu and destroy him. It was then that Kandisa revealed to him that all the hardships of his life had been orchestrated by the Mashtaan because of their fear of him. A war was coming that would encompass all the known kingdoms in a final contest between the gods with Imaro being the deciding factor. Imaro’s anger was only increased by this revelation that he had been manipulated as a mere pawn, that he was not the true master of his own fate. It was only Kandisa’s heartfelt persuasions that convinced him to reluctantly accept his role in the coming conflagration. Still he continued his hunt for Bohu. By the end of this third volume, he and his party found themselves in the land of Maguvurunde ruled by the powerful knosi (king) Mkwayo and his beautiful queen, Katisa. It is then revealed that they are Imaro’s parents. Talk about a cliffhanger ending. “IMARO – The Naama War,” picks up where the last book ended and quickly begins the final events of this ground-breaking epic. Coming to grips with his new found family and heritage, the stoic Imaro begins to accept the supernatural abilities the Cloud Striders had bestowed upon him. He gradually assumes responsibility befitting his new role as a prince. With each new conflict he is drawn like a magnet to the cataclysmic confrontation Kandisa had predicted between the great armies and the Northern Highland and those of the Eritten controlled lowlands. Imaro takes his place alongside his father, warrior-chieftain uncle and courageous cousin to lead their forces and in doing so accepts his destiny. Saunders writes the most gripping, complex and thrilling battles sequences since Homer’s tales of the Trojan War. His pen wields legions of humans and their nightmarish creature allies with a feverish skill that is unequalled in fantasy adventure and in the middle of it all, is Imaro, the greatest warrior ever to take up spear and shield and pit himself against the forces of the evil. But like all great stories, Imaro’s victory comes with a price that cuts deep into his soul and leaves him spiritually wounded. Though he saves mankind, he ironically remains the fates’ most tragic victim. Charles Saunders is Robert E. Howard’s one true literary heir. He is the finest fantasy adventure writer of the past twenty-five years. This is no exaggeration. No other fantasist on the bestseller lists today, Robert Jordan, David Eddings, George R.R. Martin, etc. etc. comes close to equaling the raw power of his stories, his sweeping imagination and the grace and grandeur of his tales. And yet he is relegated to self-publishing his own material because no publisher in either America or Canada has been smart enough to sign him to a contract. Rather it is his hundreds of fans, on-line reviewers and true aficionados of the genre who recognize his greatness and continue to support his career. When Saunders first created Imaro, his earlier books were published by DAW paperbacks. This was the early to mid 70s and sadly the books, for whatever reason, failed to find a large audience. Maybe readers simply weren’t ready for a black fantasy hero. It is this reviewer's hope that today that is no longer the issue, but rather the world at large is simply not aware of this magnificent epic and it has gotten lost on the larger digital stage. It is high time it was rediscovered. Both “Imaro – The Trail of Bohu” and “Imaro – The Naama War” are available at (www.Lulu.com). I would urge my readers not only to purchase both immediately, but to also tell all their friends and associates who love great fantasy adventure. Maybe together we can bring Imaro back to the prominence he and his creator truly deserve. I’ve a passion for reading graphic novels, much more so than the traditional monthly magazines. The opportunity to sit down and read a big, whopping graphic story in one package is still a treat for this fan. Thus, when “Hexen Hammers” arrived in the mail yesterday, I was thrilled and within minutes was seated comfortably in my office recliner and digging right into this wonderful, action horror fest from the good folks at Arcana. Ben Fisher is a capable writer and he knows how to set up both characters and situations smoothly so one follows another effortlessly. Still, one of the speed-bumps in this tale was the time anachronisms. We’re told the year is 1685 in Salem, Massachusetts and yet several of the main characters wield revolvers and other hand guns that wouldn’t exist for another hundred and fifty years. Now that is both confusing and jarring. Yet the story is compelling enough to make me shrug of that discrepancy and plow on. Hell, this could be an alternate Earth, so I chose to ignore the weapons out of time and concentrate on the plot. Hexen Hammers’ are four distinctly different men who have banded together, under the guidance of the Catholic church, to seek out and destroy all manner of demons, witches and other assorted evil monsters. They are very, very good at their job. Pike is a cold hearted mercenary only loyal to money and the other three. Father Zachary Porter is a Catholic priest unlike any you’ve ever met before and Richard King is a genius inventor who hears voices. They are led by a haunted, driven soul named John Hathaway whose sole purpose in life is to destroy demons. The camaraderie and loyalty of these men to each other, despite their individual natures is handled extremely well and one of the biggest assets of the book itself. The plot itself is direct and straight forward, they are sent to a small New England town to pick up a witch and bring her back to the Church leaders for trial. Of course nothing happens as it should and soon the Hammers are finding themselves besieged by horrific creatures everywhere they turn until it becomes clear they have been duped and sent on a fool’s quest by a traitor working for the enemy. The artwork in this book is stellar, although Mike Henderson’s style of sharp angles and features take a few pages to adjust to. But once I did, I began to appreciate it for its energy and impact. His action sequences are powerful and beautifully rendered, as are his characters throughout. He does an especially nice job on the creepy crawlers. Visually this book could give you nightmares. Henderson is aptly assisted by inker Eric Layton and colorist Adam Guzowski, both of which bring added levels to the art. Guzowksi’s choice of color palette was perfect for this adventure and brings to it a moody mystery feel the story requires. The weak link in the creative chain is the lettering. Not so much Chris Turpin’s skills, they are adequate enough here. But rather in the production phase, the word balloons are transparent so that the artwork behind them comes through. A truly annoying flaw as it often makes reading the damn words difficult when they get lost in the dark colors of the art on which they are laid. If this process was intentional, then it was a huge mistake on someone’s editorial judgment. Lettering is a separate art form and deserves to be handled with as much care and attention as any other element in a graphic novel. In this case it was terribly mis-handled. 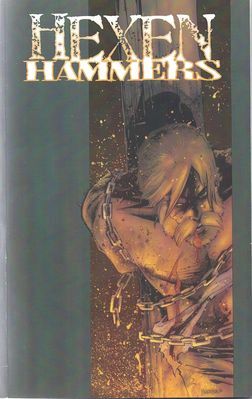 Despite the few critiques mentioned, “Hexen Hammers” is a truly powerful, dramatic reading experience that easily won me over. If you are looking for something new, original and different in a graphic novel experience; something with a solid bite, then you really need to seek this out and pick up a copy. Arcana has a solid winner here. Don’t miss it.